Ages 7 through 17. 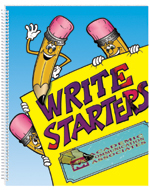 Help students with special learning needs improve basic writing skills using functional activities relevant to their interests and experiences. The activities provide opportunities for students to explore the various purposes of writing as they participate in high interest activities. Making labels and signs. Children are bombarded with printed signs and labels wherever they go. As children participate in the activities in this section, they create their own labels and signs. Making lists. Lists help us organize information, plan events, and remember planned activities. The activities in this section require students to create a variety of types of lists. Describing objects, events, and situations. Writing provides a record of what has been seen or experienced. The activities in this section require students to provide descriptive information. Expressing feelings and opinions. Students are asked to react to various types of situations by expressing their feelings and opinions. Writing letters, memos, and other messages. Written messages are often created to share information with others when it is inconvenient or impossible to speak with these individuals directly. The activities in this section provide practice in creating a variety of different types of messages. Using words to create sentences. The activities in this section require children to focus their attention on words and how they can be manipulated to create sentences. These activities are designed primarily for students who have difficulty breaking down sentences into individual words. Creating stories. The story telling activities in this section help students to sequence story events and to use vocabulary effectively to convey information in writing. As students participate in the activity, they are challenged to think as they give explanations, make comparison, describe plans, and share feelings. Reproducible worksheets are included. The printed book edition and the CD edition are the same price if ordered separately. The CD includes the entire book and makes it easy to print out copies of the reproducible book pages. Save money when you order both the book and CD at the same time.